the Bear Blog: Merry Christmas To You! It's almost Christmas and we hope you are going to enjoy family, friends and food! Are you ready for something peppy today? I want you to meet a young woman who clearly loves what she's doing with sewing and machine embroidery! I met Sue (of Sue O'Very Designs) at Quilt Market in Houston last fall. She has an outgoing and captivating personality that just pulls you right in to a discussion about her products and brand. Our Sewing Center now carries some of her designs for In The Hoop embroidery. (I also learned from her website that ITH stands for In The Hoop!). Our experts in the Sewing Center have trialed several with great success. She does make use of some specialty fabrics, including cork. So if that's something you have been tempted by, her use of machine embroidery on cork might be the little nudge that you need to get started. And, by the way, we have a good supply of beautiful colored and patterned cork. 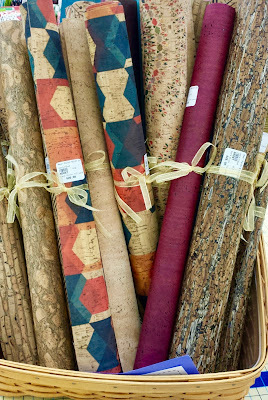 In addition to larger pieces and cork by the yard, we have small pieces (18" x 28" for $26) from Fabric Funhouse. Many more colors and designs in the basket! Sue O'Very has been making and sharing sewing related YouTube videos on the Sue O'Very Youtube channel. She has quite a list of videos covering a variety of topics, but what I especially wanted to bring to your attention is her list "Does This Notion Really Work?". If you use the link above, you will find Sue's YouTube homepage. Scroll down just a bit to find her group of videos (playlist) of her review of notions. I think there are 21 different videos right now, each featuring a different notion or tool. There's bound to be one in there that interests you! Just last week, at my Ham Lake Piecemaker's guild Christmas party, there was a discussion about what that Purple Thang is really all about. Well, Sue has a video about the Purple Thang! I've included a little introductory video about Sue O'Very here. If you like her videos, now you have something else to watch besides football over the next week or so! Merry Christmas from your friends at Bear Patch! Open again at 9am January 3 with new samples and displays!